This month’s Fresh From the Oven challenge has been held by the owner of great blog Slice of My Life and the round-up for this will be done by Purely Food. The challenge is for one of my favourite breads: pita. In these cold, wet, rather miserable days what could be better than spending some time pottering round a warm kitchen, kneading and proofing and baking? As regular readers will know, I have a bit of a ‘thing‘ for baking with yeast. There really is something so therapeutic about it, that other forms of cooking just cannot replicate or live up too. Not that I don’t enjoy other forms of cooking & baking, don’t get me wrong, I love all forms of cooking. In fact I love food, full stop. Pita breads are simple to make, but, I confess I use my KitchenAid free standing mixer to knead the dough which takes all the effort out. Doing it by hand takes a fair bit more effort of course, but either way these breads are worth it. Yet another bake that tastes better homemade. In fact, pitta don’t just taste better; they blow shop bought pitta out of the water. Since I first starting baking pitta a couple of years back I have never reverted to buying prepacked ones. Pita is not just an extremely popular pocket bread, it is the mainstay of the way Israelis eat. Anything can go into a pita — from chocolate spread (a favorite school snack) to a whole lunch, such as schnitzel with salad and French fries. Apart from packing it with innumerable foodstuffs, pita has another important use: to mop up hummus, tahini, labane, eggplant and other dips, spreads and salads. Pita must be oven-fresh or it’s no good. The recipe used for the challenge was very simple and straightforward, yielding light breads which beautifully puffed up on baking. I used a baking stone instead of a baking tray as I find you get better results with them. 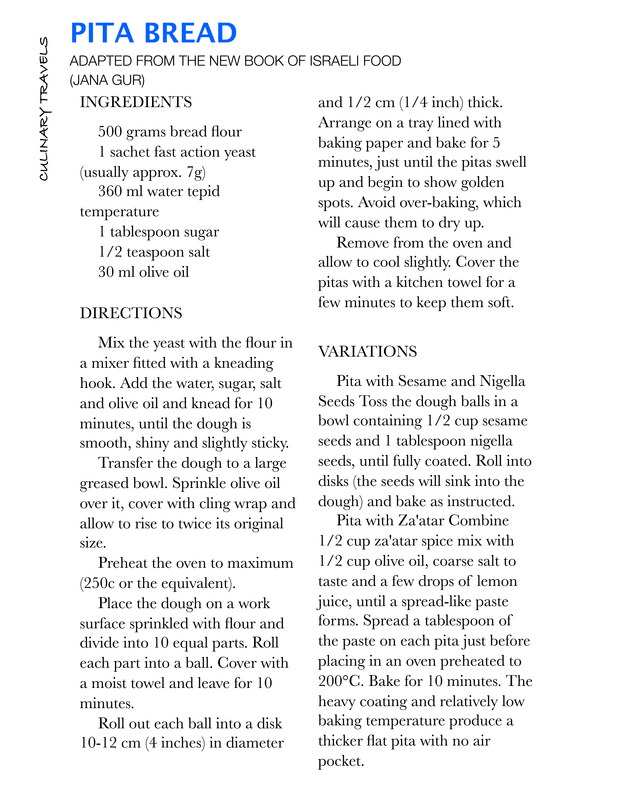 I have also included my favourite pita recipe, from Janna Gur’s amazing book: The Book of New Israeli Food. Perfect served with dips such as hummus, beetroot hummus, baba ganoush, dukka, or to serve stuffed to the gills with falafel and salad, or just alongside a tagine to mop up all those lovely juices. So versatile, so tasty, so simple. What are you waiting for? Go Bake! I am also submitting this post to the fabulous YeastSpotting run by Susan over at Wild Yeast.